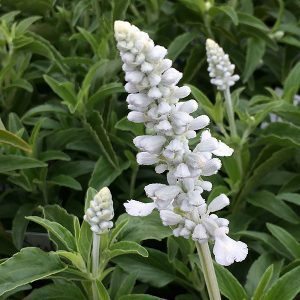 This is tough free flowering plant, and Salvia farinacea is one species that has a number of cultivars with different flower colours. Being from Mexico though to the souther state of the USA, this is a plant that will flower early in the season from spring to summer, it then will often put on a second display of flowers as the weather cools down again at the end of summer. Best planted in a well drained humus rich soil in full sun. Water through the first summer. A little slow release general purpose fertilisers in spring will be all that is need in any good soil. You can prune back after flower to encourage a busy growth habit and a second round of flowering. Try not to prune back below the foliage for best results.